As a new summer intern at 219 Design, one of the first things that struck me was how committed 219 is to adopting cutting-edge technologies that might be useful to their clients. During my initial week at the company, we acquired an HTC Vive virtual reality system. The hope was that the emerging trend could be used to improve collaborative decision making, better understand potential issues early in the development process, and more. Fortunately, these hopes were completely justified! All of the engineers and designers here were immediately blown away by just how immersive the experience was. Trying out some of the incredible existing experiences like Google Tilt Brush and HTC’s The Lab sparked everyone’s imaginations. Soon ideas were flying as to how 219 could turn this new technology into something useful for us and our clients. After a few ideation meetings and extensive research into the current state of virtual reality content, we decided to build a virtual reality product evaluation experience. As a product development company, we wanted something that could both tighten the product design loop and help us quickly and intuitively evaluate mechanical and mechatronic designs without having to build time-consuming and expensive prototypes. 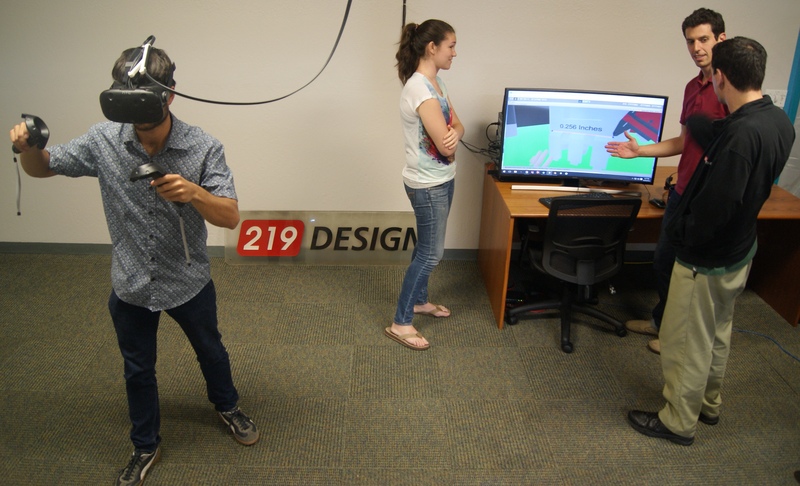 As a intern, I was lucky enough to be tasked with making this idea a (virtual) reality. It’s been about a month since I began developing the skills needed to build a virtual reality experience and then applying to these skills to our specific project. Now, we are thrilled to announce that we now have a fully functional VR app, called Interact VR. The app lets us upload our 3D mechanical and electrical designs and interact with them in intuitive and unique ways. This tool is already proving its usefulness in the product development setting at 219 Design. We’ve used it to perform mechanical design reviews, compare alternative design solutions, and quickly visualize the impact design changes will have on existing assemblies. Interact VR makes it easy for our engineers to check clearances and tolerances, explain how an assembly is going to be assembled, and give clients an intuitive way to quickly check project work to ensure that our designs directly match their expectations before a physical prototype is built. This will ultimately save our clients both time and money. We’ve learned a lot from the process of creating a VR app. Our new Hololens development kits just arrived and we are enthusiastic about assessing how mixed reality can help us deliver even better solutions for our clients! We can’t wait to see what some of the big players like Dassault Systems and Autodesk develop for these compelling new platforms, but for the time being we will continue developing our own tools to deliver better outcomes for our clients through cutting-edge virtual and mixed reality technologies.